Starting pitcher last night was Robert Zarate. He did 4 innings. He was followed by Bradin Hagens for 3 innings. Who? Followed by whom? Welcome to the 2015 Durham Bulls! Even with the diligent efforts of the front office, even with a program, it’s hard to keep track of the players on this year’s team. For that matter, even if you wear your radio at the park, sometimes they don’t know much about the players. So you just have to kind of figure it out on your own. Zarate showed up a few days ago and pitched in relief in a couple of road games. Not much history available. Stats. But he looked pretty darned good last night. He only let one run in on his 61 pitches, several of which were in the high 90’s. I think he’s going to be fun to watch. He left with the game tied at 1-1. Bradin Hagens just came up from Montgomery, where he was doing OK. Stats. He also did just fine. When he left the game was 2-2. So it looks like the Rays have not done the Bulls too much harm in this round of moves. Can’t say as much about this umpiring crew. So far they’ve called 10 Bulls games this year and they are not the best of the bunch. But it was a hot night and maybe, just maybe, the home plate ump could justify what was a bit of exuberant bat-tossing by both teams that led to two ejections. On the other hand, they really did miss the call on Cory Brown at second base and that really did make a difference. Meanwhile, a bit of tactical trivia that also made a difference. Bulls managers have historically been very reluctant to call for intentional bases on balls. So far in 2015 manager Jared Sandberg has only asked for 6 in four games. The Bulls lost every one of those games. Take last night. Top of the 10th. Game tied. Runner on second base. No outs. Jhan Marinez K’d a batter. Got a ground out (runner went to 3B). Then told to intentionally walk Columbus’ Jesus Aguilar, who had 2 hits and 2 K’s on the night. Next batter hit a home run and Clippers were ahead 5-2. 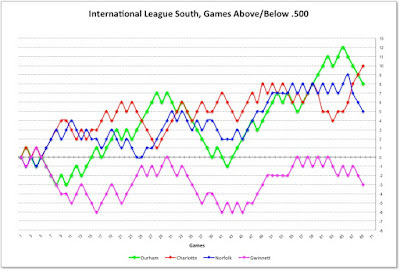 The Bulls could not catch up. However, Third Baseman J.P. Arencibia hit his 11th home run and the Bulls did get within reach. Note: Vince Belnome started at 3B, but got thrown out of the game for throwing his bat after a called third strike in the 5th. Former Bull, and Tampa Bay ace, Matt Moore is scheduled to start this afternoon. High hopes that he does well down in the bay area. Here too. Possibly the best pitcher we’ve had the opportunity to see here. Over with the Montgomery Biscuits, Leonardo Reginatto started at 3B, then shifted over to pitch in the 15th(!) inning. He gave up a home run in a 1-0 loss. Juniel Querecuto was 0 for 5 at shortstop. Bryce Stowell pitched the 13th and 14th innings. Box. 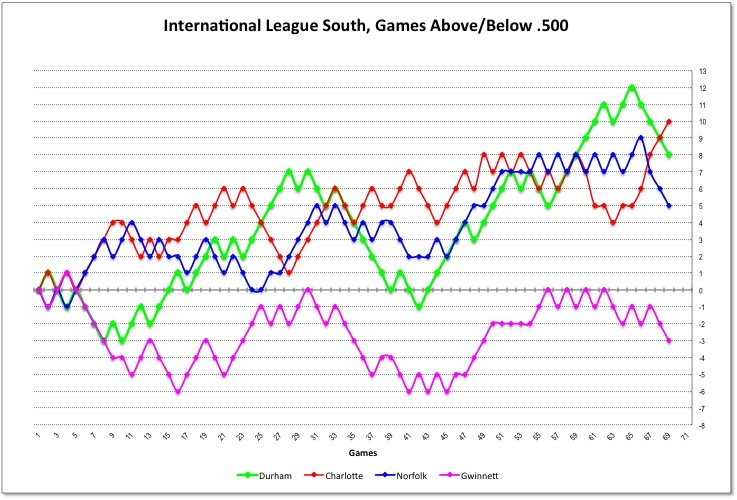 With the loss, the Charlotte Knights moved ahead of the Bulls in the International League South Division. This is a very competitive bunch of teams this year.